The world of Men has risen to meet Sauron’s challenge. The surviving members of the Fellowship, with the help of the Elves, have successfully defended the kingdom of Rohan at Helm’s Deep, even as Gollum leads Frodo and Sam ever closer to Mordor. The Dark Lord, however, will not relent in his campaign to annihilate Mankind, and is marching an even larger army of Evil, led by the mysterious Witch King, toward the nearly defenseless city of Minas Tirith. If the city falls, so too will the kingdom of Gondor, and all hope for Mankind will be lost. In a twist of good fortune, however, Gandalf learns of Sauron’s plan. He races to Minas Tirith with Pippin to sound the alarm, while Aragorn, Legolas, Gimli and Merry attempt to convince a reluctant King Theoden to ride to the city’s defense. With the fate of Middle-earth about to be decided in a last, massive battle on the fields of Pelennor, Aragorn must finally accept his destiny, while Frodo and Sam face the ultimate test of friendship, and their very lives, in their quest to destroy The One Ring. For three years now, legions of moviegoers have gathered in theaters around the world to marvel at director Peter Jackson’s epic, big screen adaptation of J.R.R. Tolkien’s classic literary tale. And every year, we’ve held our collective breaths. Could Jackson’s Fellowship of the Ring finally prove that it was possible for Tolkien’s elaborate world to be done justice on film? It did, against all odds. Could Jackson’s take on The Two Towers top the first film in action, emotion and excitement? It did, raising the stakes even higher. And then, the biggest question of all: could The Return of the King meet all of our impossibly high expectations and take its place as the crown jewel of the trilogy. Not only did it meet those expectations, it blew them all away, sweeping the 76th Annual Academy Awards and becoming the first fantasy film ever to win the coveted Oscar for Best Picture of the Year. What makes The Return of the King work so well is the way Jackson and company are able to weave the small, personal character moments against some of the most epic battle scenes ever captured on film. Despite what some (like Clint Eastwood) would have you believe, Return of the King is not about special effects, though you’ve certainly never seen grander, thanks to the talented staff at WETA Digital. On the contrary, this is very much a story about heroes, hope... and heart. 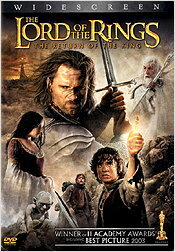 Every actor rises to the challenge in this film, and some (like Sean Astin as Sam) significantly raise their game, in service of a script that perfectly captures the essence of Tolkien’s story. Every visual is perfectly rendered here, every emotional note perfectly struck. All of the logistical effort, all of the creative passion, all of the attention to detail so carefully layered into these films... it all pays off beautifully. Simply put, with The Return of the King, Peter Jackson takes his rightful place among the greatest filmmakers of all time, and his trilogy becomes one for the ages. You simply have to see it to believe it. On DVD, this film looks surprisingly good, in full anamorphic-enhanced widescreen. I say surprisingly, because given this film’s 201-minute running time and highly complex battle scenes, I was convinced that the video quality was going to suffer compared to the previous 2-disc versions of The Fellowship of the Ring and The Two Towers. Fortunately, perhaps because of improvements in MPEG-2 compression tools, The Return of the King looks quite good, with decent overall clarity, solid color rendition, nice contrast, deep, detailed blacks, and only very minor image flaws. You will see some MPEG-2 compression artifacting, but it’s easy to forgive. The most obvious picture issue, because the film had to be compressed so much to fit onto one dual-layered DVD, is a slight softness to the image. Still, most of you will be quite happy with the picture here, even those with large, widescreen displays. I’m confident the clarity will improve on the forthcoming Extended version. One wonders, however, just how much the picture will improve. Even though the Extended version will split the film across two dual-layered discs, the fact that it’ll also be some 49 minutes longer will likely pose a significant compression challenge. Audio-wise, this disc is every bit equal to the previous The Two Towers DVD. The film’s soundtrack is presented in both Dolby Digital 5.1 EX, as well as 2.0 Surround. The EX track is highly immersive, with excellent dynamic range and a highly active mix. The Battle of the Pelennor Fields is, as you’d expect, a sonic tour de force, with smooth panning and tons of directional play. The mix is also highly atmospheric, even in quieter passages. As with the previous DVDs, the soundstage is nicely wide, with tight imaging and thunderous low frequency, and Howard Shore’s best score of the trilogy is beautifully woven into the mix. As good as this audio mix is, however, I fully expect the DTS 6.1 ES track on the forthcoming Extended DVD to rank among the best audio achievements of the year. Unfortunately, the extras on this 2-disc set are far less impressive than those on the 2-disc editions of the previous films. There is obviously no preview for the next film on Disc Two, as there is no next film. But there is also no preview of the 4-disc Extended DVD, which had been a highlight of the previous releases. One might have expected the music video for Anne Lennox’s haunting Into the West, given that it won Best Song at the Oscars, but it’s surprisingly not here either. Nor do any of the TV spots here mention the Academy Award nominations or win for Best Picture (it’s likely the extras were completed before the Oscars were announced, but still). 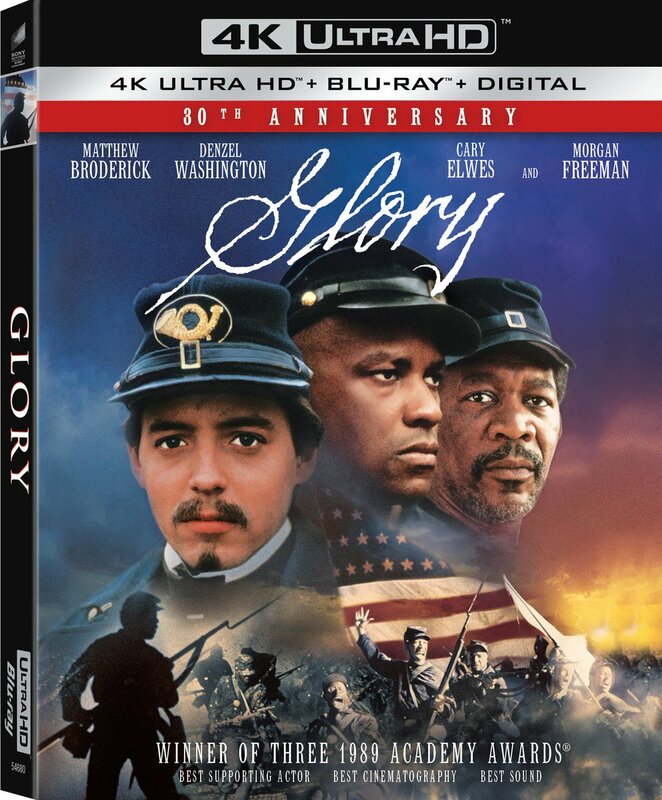 Even the packaging on the copy I received fails to mention the Oscar sweep (although this may be different on the version available in stores on May 25th). The extras you do get on Disc Two are something less than inspiring, although it’s good to have this material for sake of completeness, I suppose. The main focus here is a trio of documentaries. The first two, The Quest Fulfilled: A Director’s Vision and A Filmmaker’s Journey: Making The Return of the King are interesting in a superficial way, and do feature some nice moments. Unfortunately, there’s a great deal of duplication between them, with many of the same interview quotes and behind-the-scenes clips. At some 46 minutes, the National Geographic Special – The Lord of the Rings: The Return of the King is the longest of the extras, and features a nice look at the parallels in the story compared to real historical events and people. The problem is that you may already have this documentary on disc – it’s been available separately for months on the National Geographic Beyond the Movie – The Lord of the Rings: The Return of the King DVD. There are 2 theatrical trailers for the film in anamorphic widescreen, as well as some 13 TV spots. The EA videogames preview trailer is lame (a marketing piece), but it’s anamorphic at least. There’s also the usual weblinks to online sites and stores – who cares. Frankly, the only real gem on Disc Two is the 6-minute “supertrailer” for the entire Lord of the Rings trilogy, in anamorphic widescreen with 5.1 sound. Seeing footage from all three films edited together in this way, you really appreciate just how well Jackson’s crafted this trilogy, and how seamlessly these films work together. I get caught up in it every time I watch it. Other than the supertrailer, however, these DVD extras are almost entirely uninspiring. Still, if the bonus material is less impressive than one might have expected, most of you are probably eagerly awaiting the announcement of the 4-disc Extended DVD, which will be out in time for the holidays, and which will no doubt be loaded with great bonus material. Given that, simply having this film on disc, looking and sounding as good as it does, is what matters here. What a truly satisfying journey these films have been! There’s a line that Theoden, the King of Rohan, says to Aragorn in The Two Towers: “If this is to be our end, then I would have them make such an end as to be worthy of remembrance.” Without question, Peter Jackson and his filmmaking fellowship have crafted a worthy finale to their The Lord of the Rings trilogy. The Return of the King is a landmark cinematic achievement, absolutely deserving of its recent Oscar sweep and Best Picture win. It’s simply not to be missed.